Shashank happily came home from school and rushed to change his clothes. The final exams had at last come to an end. He washed his face and sipped on some lemon juice made by his mother. Shashank mentally analyzed all his exams and came to the conclusion that it had all gone well this time. He was awaiting the results now; which would be out next week. This pattern was followed by his school; after the final exams, they announced the results and then a long summer vacation of two months was in tow. His mother did not say anything but asked him to come back soon, very well knowing that he would not come back before four thirty in the evening. Thus, in the streets of Kolkata, the boys gathered for a game of cricket. Shashank bowled really well and although the sun hit the boys on their heads, they were least of all bothered of this deterrence. “I have done well, Papa…” he stopped. His father was quick to notice that he had stopped in the midst of the sentence. Shashank was ecstatic and delighted at the thought of a new bicycle. Being a non demanding child, he did not always voice what he wanted. His father had a business of his own, and the mother took care of the family. According to his parents, this was how a family needed to operate: and no one was complaining. Shashank was away from all these ideological constraints, yet he connected with the needs of all the members in his small family. Whenever his father and mother would have quarrel, he would slowly crawl into bed and go to sleep. He also undertook the task of keeping his desk clean and little responsibilities at home, which kept his mother happy; so she had less work. He was becoming responsible, besides. Soon, a week passed; and the examination results were out. Shashank stood second in his class, and jumped at the thought of getting a bicycle. His father ordered for the most expensive brand of cycle which was of a great quality. Shashank quietly looked at what he believed would be his prized possession from now on. One look at the bicycle and he felt enthusiastic about life. His parents for once thought as though he’s the happiest boy in town. The next day early in the morning, he quickly ate his breakfast, and was ready to go out and ride his bicycle. He had already, mentally made plans in his heart that he would ride to the adjacent lane where there was a Ram mandir and the opposite lane near the garden, where there was his favourite roll shop. As Shashank ate the last morsel of his breakfast, his father said, “Shashank, I want you to listen to some things. Fine, I have got you a new bicycle. However, do not go out on the roads or play anywhere else except the confines of the house. to make some lunch for the afternoon. Shashank told his mother that he is going to play and went out of the house. He went near the banyan tree on the other lane outside his house and saw Avinash with his bicycle. Shashank looked back and saw Avinash riding his bicycle and until his image grew fainter, he kept looking at him. He sat on the fence which was encircled around the tree. The gola-wala had come and for once, forgetting his distress, he ordered for a kalakhata gola. He paid three rupees, which he had saved all the while and happily enjoyed his indulgence. The afternoon sun was getting ferocious, and the heat was so much that his gola started melting. The sight of the black flavour dipped in the ice ball with sprinkles of lemon-juice and black salt giving way to the heat and liquefying attracted him. After he was done relishing the gola, Shashank thought about what his father had said. He could not make sense out of the statement “Do not play anywhere else except the confines of the house.” He softly sobbed and by now, passers-by were looking at him. He quickly wiped his tears and went back home. His mother got engrossed in talking to her mother, and Shashank excused himself and went inside the bedroom. He could still hear his mother and grandmother talking. As Shashank sat in the bedroom, he felt like getting up and screaming at both of them, but good manners demanded it’d be better if he keeps quiet. He did exactly that. 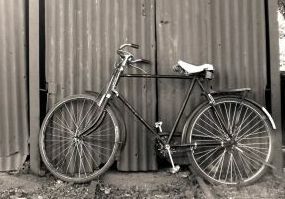 At the evening, his father made him enthusiastically ride the bicycle inside the house and outside, near the verandah. He felt like a clown; amidst all of these people staring at him this way. Somehow, he tried enjoying these moments on the bicycle but he couldn’t. Time was passing and soon, Shashank completely stopped asking his parents to go for a ride on the bicycle. Initially, he thought they would give into his demand, but he realized it wasn’t so. Slowly, time made way... and kept moving on. The next summer vacation, Shashank again rushed home and changed into more comfortable clothes. He got out of the house speedily, and suddenly the bicycle kept on the corner of the verandah caught his eye. Sighing, he made his way to the park, where his friends were waiting for him. Absolutely true, Mohit. Very well said. Sometimes we're at the receiving end of the whims and fancies of parents. The understanding should be both ways, especially when the child is in the formative years. Feedback from you means a lot to me! Parents should understand what children want and should allow them to do it. The small things pent up in the them, which they feel lifelong.